Almost all politicians vastly improve their fortunes once they get into office. With 66 percent of the Senate as millionaires, and 41 percent of the House, I’d say politics pays better than bank robbery. Hillary Clinton, the woman who would be king, made an amazing amount of money with a small investment in the commodities market years ago, turning $1000 into about $100,000. But that’s nothing compared what those two Arkansas hillbillies are worth now – estimates at $100M. Nancy Pelosi isn’t doing so badly, either. In the worst period of America’s economic history, she managed to almost triple her net worth from $12M to $35M. 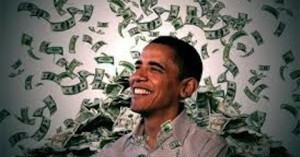 Not to be outdone, Barack Obama, who was practically broke in 2004 is worth somewhere between $2.8M and $11.8M, according to his 2012 financial disclosure forms. These figures exclude the $1.4 million in Nobel Prize money he donated to charity and his primary home. I’m not sure why Barack has such a big delta in his KNOWN net worth, unless he’s keeping some of that money with his birth certificate and college transcripts, but it’s safe to say that Barack’s investment strategy is going pretty well. So why can’t AMERICA have the same investment strategy as the those who represent us?